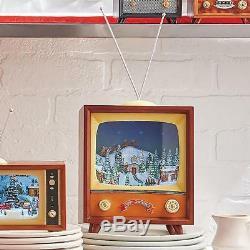 New Raz 15 Animated Musical Retro TV Television Village Scene Christmas Figure. 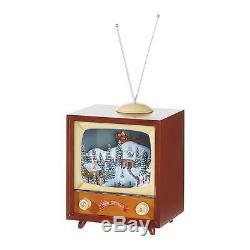 New Raz 15 Animated Musical Retro TV with Village Scene Christmas Figure. This little mountain town comes alive in this retro television! With homes tucked throughout the snowy slopes and between the trees, villagers meander around listening to Christmas songs while Santa flies over top! Plays "Jingle Bells", "We Wish You a Merry Christmas", "Silent Night", "Deck the Halls", and "Joy To The World". Requires 3 AAA batteries, not included. Dimensions: 7.5" x 6" x 15. Don't see the service you need below? (estimates are for continental US only). Item must be unused, in original undamaged packaging, and with all original materials. I work 110% to keep my customers satisfied. Get Supersized Images & Free Image Hosting. The item "New Raz 15 Animated Musical Retro TV Television Village Scene Christmas Figure" is in sale since Tuesday, October 16, 2018. This item is in the category "Collectibles\Holiday & Seasonal\Christmas\ Current (1991-Now)\Figures\Other Curr. The seller is "shopaholic_finds07" and is located in Lithonia, Georgia. This item can be shipped to United States, Canada, United Kingdom, Denmark, Romania, Slovakia, Bulgaria, Czech republic, Finland, Hungary, Latvia, Lithuania, Malta, Estonia, Australia, Greece, Portugal, Cyprus, Slovenia, China, Sweden, South Korea, Belgium, France, Hong Kong, Ireland, Netherlands, Poland, Spain, Italy, Germany, Austria, Mexico, New Zealand, Switzerland, Norway, Ukraine, Croatia, Brazil, Chile, Colombia, Costa rica, Dominican republic, Panama, Trinidad and tobago, Guatemala, El salvador, Honduras, Jamaica, Antigua and barbuda, Aruba, Belize, Dominica, Grenada, Saint kitts and nevis, Saint lucia, Montserrat, Turks and caicos islands, Barbados, Bermuda, Bolivia, Ecuador, French guiana, Guernsey, Gibraltar, Guadeloupe, Iceland, Jersey, Cayman islands, Liechtenstein, Luxembourg, Monaco, Martinique, Nicaragua, Peru, Paraguay.